"So many girls in every port, you gotta be a juggernaut...full speed ahead or you'll be caught..."
There's a telling moment midway through Elvis Presley's 24th theatrical effort, Easy Come, Easy Go. Surrounded by hyper adoring females and a backing band of extras who have never played a musical instrument in their lives, the star of the show is gamely trying to get through yet another inane force-fed song, which made him just short of physically ill at a recent soundtrack recording session. For a brief moment, the Hollywood façade drops. Teeth clenching, a visible look of disgust colors the rock legend's face only to disappear as quick as it arrived. Still, it's indicative of the inner turmoil the Tupelo boy-made-good was experiencing at that moment. Ten years earlier, things were different. Presley wasn't just being hailed as the king of rock and roll, but the newest crown prince of Hollywood, too. In a mere three days after its released, his 1956 film debut Love Me Tender had already earned back its one-million-dollar production budget. A four-track, extended play single of songs from the movie gave birth to the soundtrack album. By the mid-1960's, Elvis consistently placed among the top ten most popular box office stars, eventually becoming the first actor to be paid a million dollars for a single role—plus a percentage of the profits. In the end however, the accomplishment rang hollow. While Presley's financial stock rose, the quality of his roles did not. Combined with a play-it-safe manager and the demand for at least three pictures per year, a once entertaining recipe for success became sorely compromised, with budgets to shooting schedules cut by half. Already ludicrous plots grew sillier and songs that would not have passed muster on a Frankie Avalon vehicle made final cuts. Even the most loyal devotees became disenchanted. What's most depressing about Easy Come, Easy Go is that it was produced by Paramount, where superior Elvis efforts like Loving You, Blue Hawaii and King Creole originated under the watchful eye of legendary producer Hal Wallis. But even the home of the King's classiest movies couldn't reverse the downward spiral, with the end result being a sad end to a once fruitful partnership between the veteran producer and Presley. Elvis plays singing Navy frogman (now, there's a stretch) Ted Jackson who's just days away from returning to civilian life. On one final diving expedition, he comes across sunken treasure but can't touch it for fear of suffering reprimand, much to the delight of two loot hungry scoundrels (Pat Priest, Skip Ward) who want the goods for themselves. Faced with stiff competition, Ted enlists the help of old nightclub crony Judd Whitman (Pat Harrington) and vivacious go-go dancer Jo Symington (Dodie Marshall), whose father just happened to have been the captain of the ship on which the treasure originated many moons ago. Granted, the plotline sounds like a better than average attempt to jazz up the typical Elvis movie formula, with co-stars Harrington and Marshall giving their all to make the best out of mediocrity. But cursed with horrible dialogue, Presley's detached performance and a beyond inferior soundtrack, the film is practically dead on arrival. As a long time fan who appreciated the likes of Girl Happy and Spinout, I can honestly say that this is by far the nadir of his acting career. Image Transfer Review: The image is kind of a mixed bag, with colors all over the map as far as accuracy. Most scenes are perfectly balanced; others look awkward with characters sporting very unnatural fleshtones. Or perhaps in Elvis' case, maybe his face really was a dark shade of red (singing songs like "Yoga Is As Yoga Does" will do that to a person). Sharpness is fine and very little grain is in evidence. Audio Transfer Review: How ironic is it that the worst Elvis soundtrack ever sounds halfway decent here. Very good 5.1 reconfiguration, particularly during the incidental scoring, which winds up being more impressive than the song offerings (which sound very compressed and muffled at times, but that's the fault of the producer of the original sessions). There is very wide soundstage in the fronts, with the rears utilized for ambient purposes. For the purists, the film's original mono soundtrack (in both English and French flavors) is retained. Extras Review: Nothing, which in this case, is a blessing (but it would have been nice if Paramount had included at least the original trailer. Then again, maybe that in itself is a blessing). 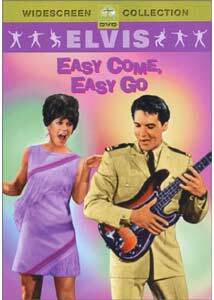 Unless you just have to have every Elvis movie ever made, pass on Easy Come, Easy Go. Invest in better Presley product like Girls! Girls! Girls! or Fun In Acapulco instead.